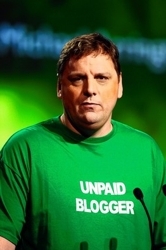 Michael Arrington, a former corporate attorney who, via his TechCrunch blog, has become one of the most influential figures on the Web, is the quintessential blogger: intense, passionate, consumed with his subject, opinionated, sleep-deprived, forward-thinking, easy to irritate and apt to air his grudges in public. Arrington’s vast network of Silicon Valley sources—many gained through his legendary parties—allows him to be ahead of the tech-biz curve and often play Web 2.0 kingmaker. Arrington attended Claremont McKenna College (BA Economics, 1992) and Stanford Law School (JD, 1995), and practiced as a corporate and securities lawyer at two law firms: O’Melveny & Myers and Wilson Sonsini Goodrich & Rosati. His clients included idealab, Netscape, Pixar, Apple and a number of startups, venture funds and investment banks. He also co-authored a book on initial public offerings. Michael Arrington added a position as Limited Partner. Michael Arrington added a position as Mentor at i/o Ventures. Michael Arrington added a position as Founder/Board of Directors at Edgeio. Michael Arrington added a position as Founder at TechCrunch.